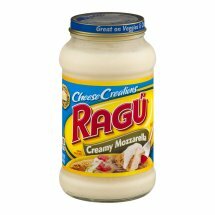 Ragú Cheese Creations Creamy Mozzarella Sauce 16 oz. 80 calories per 1/4 cup. Water, Soybean Oil, Cream, Mozzarella Cheese (Pasteurized Non Fat Milk, Cultures, Salt, Enzymes), Modified Corn Starch, Enzyme Modified Egg Yolk, Whey Salt, Parmesan Cheese [Pasteurized Part-Skim Milk, Cheese Cultures (Contains Barely), Salt, Enzymes], Whey Protein Concentrate, Xanthan Gum, Yeast Extract, Garlic Powder, Natural Flavor, Spice.